Third year student Ross Martin studies BSc (Hons) Police and Criminal Justice Studies at Plymouth University. 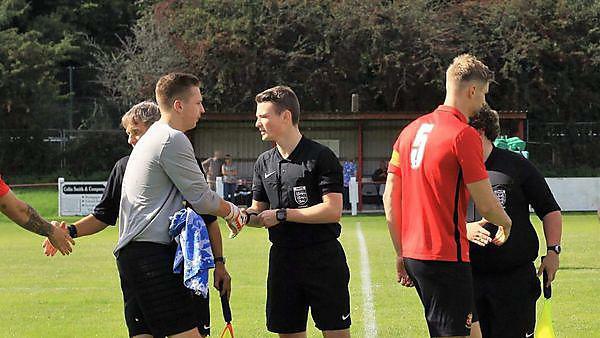 Through volunteering with the League, Ross qualified as an FA Referee in 2012 and with five years experience officiating the game, is now a Level 4 referee. This allows Ross to assist in the National League South (6th tier of English Football) and officiate as high as the South West Peninsula League (10th tier of English Football). Ross is a 'Referee Coach' on Devon FA’s Centre of Referee Excellence (CORE). In this role, he works with the County FA’s Referee Development Officer to deliver courses, tutoring and mentoring new referees in the game. As a committee member on the West Devon (Plymouth area) Referee Association, Ross represents West Devon at Full County meetings, coordinates training events for referees in the West Devon area and organises guest speakers for CPD activities. Away from refereeing, Ross is a committee member on the Devon Wednesday Football League and in 2016-17 became League Secretary for the League. In this role he is the first point of contact for teams and is responsible for all League correspondence and day-to-day management. For the 2016-17 season, Ross was a Project Officer for West Devon on Devon FA’s Youth Council, promoting the County FA’s Football Futures programme and introducing new young leaders to football leadership roles. To support their development he delivered a referee workshop, successfully introducing 20 new members to refereeing at a leadership camp in Plymstock. As a project officer, Ross has supported Devon FA events as a volunteer and has a role on the Son-Rise Cup – a large scale event in Tavistock that supports disability football in the West Devon area. For this annual weekend-long event, Ross appoints and supports referees at the event, utilising it as a training tool for referee development. Across these roles, Ross has undertaken 170 hours of voluntary work in community grassroots football in 2016-17 season alone, a great achievement for a full-time University student. He has achieved so much and is recognised for having a bright future in the game.